R. had an extra ticket for Bob Mould last week, so I went and saw him play, at the venue that used to be the Irving Plaza and now has some confusing hyphenated name. I was glad I went, as the show was much better than I expected: Bob looks good, he can still play fast and loud, and his backing band seemed young and excited. His voice is shot, but that’s probably to be expected. But he played a fair amount of his old work, including “Hardly Getting Over It” off this CD, which I certainly hadn’t been expecting. The last time I’d seen him had been a decade ago, in some seated venue in Boston filled with a balding crowd of aging punks; the whole thing was dispiriting, not least when a member of the crowd exhorted us to dance in the aisles to minor effect. The punks have aged further; but this crowd looked better, doubtless because in the time since I saw him last Bob Mould has become a minor gay icon. I have acquired, as it turns out, a fair number of Bob Mould CDs in his various incarnations, starting with the Sugar CDs which I picked up back in high school and going up to one of the not very good late-90s solo Bob records, sweeping back in time to include most of the Hüsker Dü records. I’m not sure why: there was almost always something good on each of these records, but I’m not sure that I ever really unconditionally loved any of them, save for Sugar’s Beaster, with which I was briefly and unhealthily obsessed. They filled a certain need though: the teen need for angry depressive music; there was enough variation in the quantities to keep things interesting. Listening to Bob again, it was striking how concrete a lyricist he is: he deals in concepts rather than specifics, more pronouns than not, only the most basic of metaphors. It’s easy for the listener to insert himself into his abstractions. More discerning taxonimists of punk called Hüsker Dü “emo”; that word came to mean something embarrassing, but one could draw a connection. 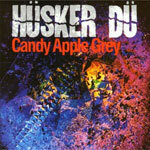 I bought this copy of Candy Apple Grey in Rome in the summer of 1999; I think it was at the used record store on via dei Mille. Google Street View suggests the name was Millerecords, and that it’s still in business, though that’s hard to believe. For part of that summer, I was living in a third-floor apartment a few doors down the street. I have a distinct memory of sitting at the kitchen table of that apartment, listening to this CD on a rented laptop while working on the LG Rome book, on headphones, I expect. I was listening to a lot of punk and post-punk that summer: Joy Division & The Fall. I was being unpleasant. This is an intentionally depressing record: you can’t get around that. Listening to it, you get the sense that everyone in the band hated each other, which may well have been true, though I don’t know Hüsker Dü history well enough to know whether that’s true or not. This isn’t a record one can pin on any Roman narrative (though that summer some well-meaning graffitist was tagging Trastevere with the Hüsker Dü logo); this is unavoidably a record about young Midwesterners angry at how terrible the world is. It’s a hard record to listen to; I remember playing it over and over that summer, but I don’t know if I’ve played it since. It’s very easy to associate a record with a state of mind; there’s the temptation to blame it on the record, to claim susceptibility. I don’t know if that’s ever actually the case. But it’s an imposing record, from the front cover on in: the stenciled logo; the inscrutable art that suggests something industrial, an oil slick, maybe; the title, which refuses to make sense. Most of all the sound of it, the sound of three people who aren’t having a nice time. The slow songs are the songs I remember here, songs I played again and again – Mould’s “Hardly Getting Over It,” which seems to be about a child’s apprehension of death, and Grant Hart’s “No Promise Have I Made,” a ballad in form, an angry break-up song in content. (The faster songs aren’t as memorable: the lyrics are equally despairing, but the production is too polished and it feels a bit too much like straight-ahead rock of the ’90s.) There’s a tension between Mould’s lyrics, exhaustive self-scrutiny that occasionally detours into the bathetic – “Grandma, she got sick, she is going to die / And Grandpa had a seizure, moved into a hotel cell and died away / My parents, they just wonder when they both are going to die / And what do I do when they die? ” – and Hart’s comical anger-for-anger’s sake. There are a couple airplane disasters for good measure. It’s a queasy record. I don’t know if it’s a good record. But it is a powerful record: in my memory it’s an analogue for being unhappy with the world. Why was I unhappy with the world then? That summer I theatrically told people I was having an art crisis, that I wasn’t sure that there was any meaning in any sort of creation; where exactly that excuse came from, I don’t remember, but I did convince myself that was the reason for my unhappiness. Rome means anything you want it to. I was trying, with some success, to drag personal meaning out of William Gaddis’s The Recognitions; this was unfair to the book, I realize now, but it did seem vaguely possible that answers could be hiding somewhere in its apparent opaqueness. When all you have is a hammer, everything seems a nail; from inside this, it’s hard to understand this. A decade later, it’s nice to hear this record, but I don’t believe in it anymore: the sacred power’s drifted away, and it’s just a battered CD. It had its place: that’s something. When I left Cambridge for Rome, I generally neglected to make any plan for doing anything with those possessions of mine that I couldn’t fit into a suitcase. Some ended up in the Co-op basement; a majority were left in the Cognoscenti office in Winter Hill – as Cognoscenti went under while I was away, I don’t know what happened to those things – and a couple of boxes of books & CDs were left with people who might appreciate them. Some of these things came back, some didn’t; for the most part this was no particular loss. It’s a lot of work having things; or rather, it feels nice to leave them all behind: the idea of starting fresh and escaping one’s past seems increasingly impossible, but at the turn of the century there was still that promise. So it was a surprise when an email arrived from M. a few weeks back saying that she’d discovered some of my boxes in her parents’ basement and did I want them? Of course I did; and a heavy box promptly arrived here full of books and CDs, a slightly used Christmas where I’d bought most of the presents myself. The books present a snapshot of a certain point in time: Richard Powers, Charles Olson, Melville’s Pierre, Evan Dara’s The Lost Scrapbook, a handful of copies of The Baffler: respectable, mostly. I did feel a twinge of disappointment that my signed copy of The Broom of the System is most likely lost forever. There were more CDs: a lot of Scott Walker, a lot of Autechre, some Stereolab, a bunch of inserts for CDRs handwritten in green pen, my Joy Division box set. Looking through these things, I can’t avoid feeling embarrassed for my past self’s pretentiousness – did I foist these things on M.? did she select them? I don’t know. ; probably it’s not worth digging into. This CD was on the top of the pile. It’s a CD single, the first thing I bought by Autechre; this would have been when I was a sophomore in college which was during the brief window when the record companies were putting out very long CD singles. They were cheap; every record store had a rack of them, and they often seemed like a decent risk when it was closing in on midnight at Tower Records, you needed something new, and had very little money. It goes without saying that most were terrible and the magic fell out of them quickly; so there was a lot of consideration of the rack. 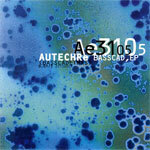 This one I know I thought about many times before buying: it was cheap and Autechre was associated with Aphex Twin, but it looked imposing. I remember almost being afraid of it: it might be too hard, I thought, though I’m not sure what that would have meant. This CD still looks good: the cover image is blue and purple droplets on a green background, something like a restrained psychedelic light show, though more oceanic; the image on the reverse uses the same colors with video-like distortion. The text, though, conveys most of the affect: layered, screened out, multi-sized, negative leading. There’s a flagrant disregard for punctuation, connective words, spaces, and vowels; numbers are all over the place; the case of characters changes at random. It’s made to look technical: track numbers are given as “0.01” and “0.02,” while track lengths are listed as “410SECS.” The inlay is clear. It’s dated now, of course: you look at this and immediately think Ray Gun or Designers Republic, early nineties – and this is, of course, a DR sleeve. It’s been done to death since. Fifteen years ago this looked hopelessly exciting: it smacked of “computers” when computers where still something things could smack of. The signifiers of science fiction are there, even if there’s no overt narrative: “basscadet” suggests “space cadet”; space ship displays would use the same monospaced fonts; in the future, everything would seem technical and we would have no time for spaces between words. A few years later computers would be out, but the sensibility filtered down to the masses; everyone was wearing t-shirts with big-eyed aliens on them. The music is pleasant, if it no longer feels as dark and inhuman as it once did. It feels like techno: things happen regularly, there are occasional breaks, you could almost dance to it. Things build and repeat. There are vocals, but they’re deeply buried and the listener only gets the sense of words. The tracks are recognizably song-like if not songs; Björk could have sung over most of this. The track I remember liking most at the time was the “Beaumonthannanttwomx,” a remix done by one Beaumont Hannant: it feels sparkly, sounds echo back and forth very quickly, and there’s a majestic build. Now this feels like something I’d discount for trying to be emotionally manipulative: it feels too cinematic, though movies didn’t sound like this then. It’s sad and yearning: I can see why a teenager would have liked it. The Seefeel remix still feels claustrophobic in the right way, siren-like loops in a dubby echo chamber, the vocal samples distorted still further. It’s no longer techno, but a little too exciting to be ambient. The “Tazmx” slows down the techno to become something which feels more hip-hop than I would have admitted at the time, washes of strings, some scratches. Trip-hop, I guess. It outstays its welcome. The last mix takes away the beats of the original, stretches everything out, and adds echo, not quite dub but something close. I decided I liked this & bought a lot of other Autechre CDs; the thrill wore off about the time that they came out with Confield and I realized that I liked the fake tracks that had been floating around the Internet more than the actual album, though I stayed with them for a bit. The whole project started to seem too hermetic: this is, at a very basic level, headphone music, a music about isolation. Now it seems like the music of a teen romantic.